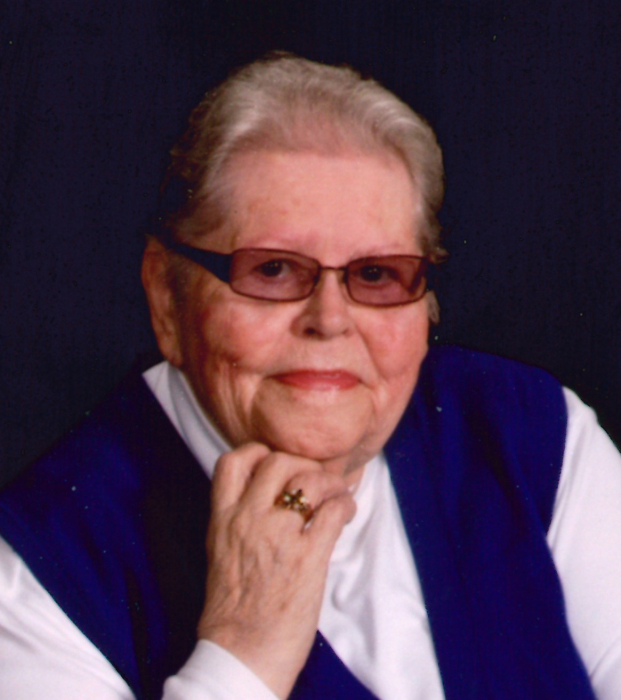 Rock Valley, IA: Madonna E. Plueger, 91, of Rock Valley, Iowa died Monday, March 18, 2019 at Whispering Heights in Rock Valley. Mass of Christian Burial will be held Thursday, March 21, at 10:30 AM at St. Mary’s Catholic Church of Rock Valley with Father Douglas Klein celebrating the mass. Burial will follow at St. Mary’s Catholic Cemetery of Rock Valley. Visitation, with the family present, will be held Wednesday, March 20, at Porter Funeral Home of Rock Valley from 6:00-7:30 PM. A prayer service will be held prior to visitation on Wednesday at 5:30 PM. Madonna Plueger was born January 17, 1928, in Lyon County, Iowa, the daughter of Joe and Gladys (Kramer) Ripperda. She married Don Plueger on December 28, 1948, in Rock Valley. The couple lived on a farm by Rock Valley before moving to town in 1956. Madonna worked for Waddell & Reed in Sioux Center, Iowa, then Kooima Machine for a while, then she managed the Rock Valley Golf Clubhouse for 18 years. Madonna was a member of St. Mary’s Catholic Church, St. Mary’s Guild, and the Catholic Daughters of America. She enjoyed camping, and playing dominos and cards. Madonna was known as an excellent cook. One of the foods she was best known for was her potato salad. She also liked to go square dancing on Saturday nights with Don. She will be missed and her memory will be cherished. Madonna is survived by eight children, Suzanne (Galen) Schemmel of Alvord, Iowa, David Plueger of Canton, South Dakota, Duane (Kathy) Plueger of Sioux City, Iowa, Dale (Bev) Plueger of Rock Valley, Iowa, Douglas (Sue) Plueger of Rock Valley, Iowa, Sandra (Harlan) Rens of Sioux Falls, South Dakota, Darrell (Madona) Plueger of Goodyear, Arizona, and Daniel (Monica) Plueger of Sioux Falls, South Dakota; 20 grandchildren; 41 great grandchildren, 1 great-great grandchild; brother, Dan Ripperda of Sioux Falls, South Dakota; and many nieces and nephews. Madonna was preceded in death by her husband, Don; infant daughter, Sheryl; parents, Joe and Gladys; grandson, Chad Plueger; an infant brother; sister, Mary Ann Selken; and brothers, Larry Ripperda, Frances “Rip” Ripperda, and George Ripperda.